Yamada, 35, operates Noble, a bar in the Yoshidamachi district of Naka Ward in Yokohama, a port city adjacent to Tokyo. He said he wanted the drink to symbolize hope. His concoction was also named World Cocktail of the Year, according to the International Bartenders Association. "Despite the severe conditions caused by the earthquake, there will definitely be a great sunrise that will shine all over Japan," Yamada said in explaining his chosen theme. Bartenders from 56 countries affiliated with the IBA took part in the event. While Great Sunrise was praised for its gorgeous taste, Yamada also drew kudos for his stylish and graceful movements--a trait that many Japanese cocktail mixers exhibit. Great Sunrise is a shaken drink poured into a Libbey Bravura glass decorated with cocktail cherry, apple, lemon, orange and pineapple leaves. Yamada also won the DNA prize (Drink and Name Association) and the IBA Prestige Award for best in technical performance. Yamada's cocktail also snared the Fancy Drink Competition, which ranks drinks based on their appearance. Yamada is the fourth Japanese to be named as Champion of the Year. According to the Nippon Bartenders Association (NBA), Yamada clinched the title not only for the exquisite taste of the cocktail, but also for his smooth style. While other contenders had somewhat exaggerated manners, Yamada didn't exhibit any showy movements. "He entered the ring with his Japanese manner without pandering to Western styles," said an NBA official. After he was selected as the representative of Japan last year, Yamada started to learn the art of Japanese tea ceremony. Bartending has something in common with the tea ceremony in that it requires elegance and accuracy, Yamada explained. 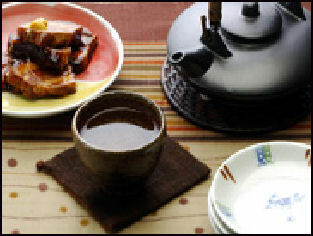 "In 'chanoyu' (tea ceremony), one must rule out useless movements and come face-to-face with tea," he went on. "A bar is also a place where we open ourselves to alcohol drinks." The art greatly helped him to control his movements so that his skills shined, he added. As a child, Yamada was fascinated by the world of bars--which was closed to him. After Yamada graduated high school, he worked at a food company. He was 22 when he became a bartender in Yokohama. Since then, Yamada has gone great lengths to hone his skills and win acclaim. There is an unspoken rule in the IBA that contestants have only one shot at trying to win the title. "I am overwhelmed with emotion. This is the real start for me as a bartender," Yamada said. Japan is currently experiencing a wine boon. Sales have been increasing by more than 10 percent a year since 1995 and there are waiting lists for department store wine tasting classes. At some wine bars in Japan you can buy a glass of 1981 Chateau Lafite-Rothschild for $50 a glass. Wine sales have been boosted by the popular manga Kami no Shizuka (“the Drops of God”). Overall though, Japanese don't drink that much wine. In 1996, the per capita wine consumption was 1.29 liter per capita, compared to 60 liters per capita in France. Many Japanese believe a red wine goes best with squid. The Japanese are big on Beaujolais. Each year when the new Beaujolais is produced in France, boxes of it are shipped by plane to Tokyo and for the traditional first glass. Domestic wines are produced in Yamanashi, Nagano, Tohuku and Hokkaido. The tax on wine is half that of sake. There has been some discussion of raising the tax on wine to the same levels as sake. Whiskey and scotch are widely consumed in Japan. They are drunk mizuwari (mixed with water) or onzarokku (n the rocks). Suntory and Nika make domestic whiskey. Foreign whiskeys are often given as gifts and drunk on special occasions. In the 1970s whiskey was often the drink of choice among sophisticates followed by sake. On the streets of Japan it is possible to get scotch and soda in a can from a vending machine. Liquor is sold at some supermarkets and companies that make scotch and other spirits advertise on television. In the film Lost in Translation the character played by Bill Murray goes to Japan to shoot a whiskey commercial. A professor at Tokai university developed a method for synthesizing carbon nanotubes from vodka and whiskey. Japan is now regarded as one of five major whiskey-producing countries along with Scotland, Ireland, the United States and Canada. The popularity of highballs in the late 2000s helped boost whiskey sales. In May 2008, a Japanese whiskey---the Yoichi 20 Years Old single malt produced by Nikka Whisky Distilling Co. In Hokkaido---was vote the world’s best single malt whiskey at the World Whiskey Awards, beating out competitors from Scotland and Ireland. In addition, Japan’s Suntory Hibiki was voted the world’s best blended whiskey, a title it won the previous year. The origin of Japanese whisky industry has ties to Scotland. Suntory founder Shinjiro Torii hired Masataka Taketsuru, who studied distilling in Scotland, Taketsuru went on to found Nikka, another major Japanese whisky producer. One of Torii’s goals was to create a whisky that suited the Japanese palate, which emphasizes light, subtle flavors. Barrel-aging is a key to how whisky tastes. Suntory uses three kinds: American and Spanish oak and Japanese mizunara oak. Michelle Lock of AP wrote, “American white oak contributes to a dry flavor with hints of vanilla; the Spanish oak has flavors of raisin, chocolate and caramel; and the mizuna gives subtle sweetness and spiciness, reminiscent of incense. Hibiki is a blend of more than 30 individual whiskies with the final blend tipped of with a whisky aged more than 30 years. Locke wrote, “Elegant and smooth Hibiki uses mild plum liqueur casks for aging some components and a bamboo charcoal filter that “just mellows out the flavor, and gives it a very sweet and gentle flavor.” The Hibiki label has 24 facets, a nod to the 24 “seasons” on the traditional Japanese calendar. Shinjiro Torii (1879-1962), the founder of the company that became Suntory, is regarded as the father of Japanese whiskey. Using his experience as wholesaler in the drug and beverage industries, he began working on a formula for his Kakubin (square bottle) brand of whiskey before World War II at a distillery between Osaka and Kyoto that he chose because of its nearness to a water source under a bamboo forest. After years of hard word he finally hit on the perfect blend for Torys whiskey released in 1946. In the 1950s highballs made with Torys became popular at small 11-seat bars in Tokyo and elsewhere. Torii is said to have had a highly refined sense of smell and taste as well as an instinct for business. The first whiskey made by Suntory “ the first Japanese-made whiskey “ was a dismal failure. Based on recipe used to make Scotch it was too strong-smelling and strong-tasting for Japanese tastes. Torii then embarked on efforts to produce a whiskey that suited Japanese tastes. Every night, it is said, he took a glass to his bedroom and sampled different blends. Sochu (clear distilled liquor) is the same as Korean soju. Traditionally consumed to get drunk and favored by alcoholics, it is relatively cheap and has an alcohol content of between 20 and 30 percent. It is now more popular than sake and well liked by Japanese from all social classes. In 2003, 940,000 kiloliters of sochu was sold, compared to 870,000 kiloliters of sake. Sochu is usually made with barley, millet grain, maize and sweet potatoes. It has also been brewed from carrots, eggplant wasabi, taro, spinach, tomato and pumpkins. Japanese sochu is usually made from sweet potatoes, rice, barley or buckwheat and has an alcohol content of 25 percent.. It has traditionally had a low-brow reputation. In the Edo period it was used as a disinfectant. These days it is often drunk on the rocks or with hot water. One bar owner told the Japan Times, “Taste is not important.” Many women mix it with other drinks such as lemon juice or buy fruity canned cocktails made with it. Sochu is particularly popular in southern Kyushu, where its is consumed in large quantities at weddings, parties and family meals and even given to the dead instead of sake. A lot of the sochu in Kyushu is made in small family-owned distilleries, particularly in Kagoshima, Kumamoto, Oita and Miyazaki Prefectures. . Sales of sochu have been increasing as Japanese have become more concerned with cost and getting the biggest bang for their buck. Lately is has been promoted as healthier than sake because it has less sugar and doesn’t cause hangovers. Some shochu makers are hoping to capitalize on the popularity of Japanese food abroad and introduce sochu that can be consumed with it. Popular sochu brands include Jinro, Legend and Triangle. The drink is known for versatility. It can be mixed with green tea, icy oolong tea, lemonade, fresh orange or grapefruit juice, sherbert or anything. Sochu is often flavored with plum. In the early 2000s, it was sold infused with nicotine. Sochu's "cheap and nasty" reputation was mollified somewhat in the 1980s when korui sochu (the highest grade sochu) was introduced. This odorless drink was produced using industrial methods and became a favorite of women. Demand for sochu nearly doubled in the 1990s after otsurui (second grade sochu) was marketed. Also called "genuine" sochu, it is an aromatic virgin liquor distilled using traditional methods. Premium sochu’s are becoming increasing popular. Mitsui & Co. make a sochu from sweet potatoes called Nanako that sells for $100 a bottle. The liquor is made using yellow rice malt in handmade cedar tubs. Other premium types sell for $200 and $300 a bottle. Canned, cocktails flavored with lemons, grapes, blueberries, oranges and other sweet things and low calorie alcoholic drinks based on sochu are becoming increasing popular. Shipments of these drinks has soared 42 percent in the past 10 years and taken up the slack left by the fall beer consumption. Dregs from sweet-potato-based sochu are being turned into biofuel. In the past the dregs---a brown fluid containing water and sweet potato fiber---was dumped in the sea. But after a ban on that practice was that imposed, sochu makers began dividing the solid and liquid matter, with the solid material being dried and used as cow feed and the liquid is condensed into ethanol. Okinawans like to drink awamori sochu liquor. It is made from rice and quickly fermented with a dark yeast that causes the brew to literally boil with fermentation The vapors are condensed into a very potent alcohol that is watered downs to either 25 percent or 48 percent alcohol. The entire process from rice to drink takes 16 days. Awamori has traditionally been made with rice from Southeast Asia. Some is consumed fresh weeks or months after it is made. Some is aged for up to 30 years to remove the sharp bite. Awamori ages three years are mor is called kusu. Awamori makers are making aged awamori from crushed Thai rice that is aged for 10 years. It is said the longer awamori is stored the richer the taste. Okinawan brewers receive a special tax break of ¥351 per 1.8-liter bottle of awamoto. The tax break has been in affect since 1972. There is some discussion fo rescinding it in 2012 which many think will have a sharp impact on awamori consumption.